Probably executed for the patrons, a nun and a cleric, portrayed on fol. 173; owned by Oorts in 1596 (inscription on first vellum fly leaf); purchased for Ki.... Bibliothek 19 January 1877 by M. H. Blummers, Tithograf... S'Gravenhage (inscription on first paper flyleaf); E. Clark Stillman Collection; Bequest of E. Clarl Stillman, 1995. 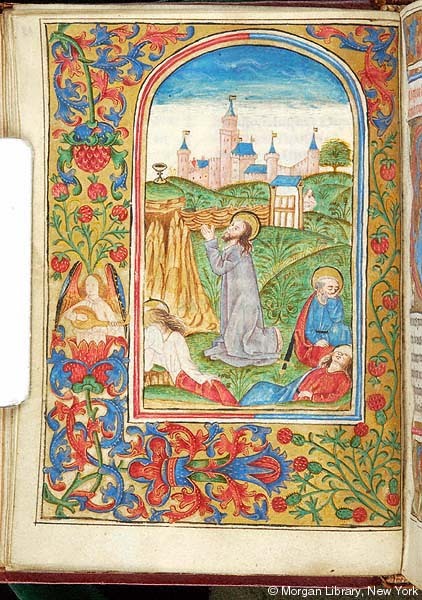 Ms. book of hours; written and illuminated in the Netherlands, ca. 1485-1495. Decoration: 6 full-page miniatures with full figured borders (inserted), 6 text pages with full borders; 7 large illuminated initials. Representations of patrons in border on fol. 173: a kneeling tonsured cleric in white robe with scroll inscribed "misere" at the bas-de-page, a kneeling nun in brown robe with black cape in righthand margin, holding up a scroll inscribed Sct Michael ora pro me. Watermark: on paper flyleaf, similar to Heawood nos. 3696-3697, 3709-3711, dated England/Scotland, 18th century; same watermark as for MS S.3. Textiles: 2 loose silk ribbon markers.